Whalen and Miller were sentenced following serious road traffic collision, North Edinburgh'. THE angry family of a ten-year-old boy mowed down on a crossing by a thug on a stolen motorbike have slammed the sentence handed down. 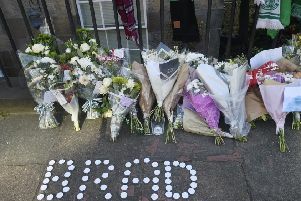 Their lad suffered horrific injuries and has been left with a limp and partial paralysis after the Drylaw hit-and-run in August that shocked a community. The two men who were involved in a serious road traffic collision. Connor Whalen, 20, was given three years and eight months. The friend he was racing, Marc Miller, 23, was given two years and 11 months. The boy’s father said: “The doctors told us to prepare for the worst. They said not many kids could survive if the bike was going 40mph. Whalen and Miller will also be subject to a 12-month Supervised Release Order when let out of prison. Both men had previously been disqualified from holding a driving licence. They pleaded guilty earlier this month. And Tory Mark Brown said: “Dreadfully light jail term here for an absolutely horrific incident in North Edinburgh where bike crime continues to blight the community despite significant inroads being made by local Police. Sentencing Whalen and Miller at Edinburgh Sheriff Court yesterday, Sheriff Thomas Welsh QC labelled their conduct “disgraceful and extremely dangerous”. Their victim has been left with a limp and restricted movement in his right arm. He also suffered permanent scarring and will need further surgery. He returned to school for the first time in early December. Both Whalen and Miller have previous convictions for traffic offences involving motor bikes. They had both pled guilty previously to stealing the bikes on Saturday, August 19 and to dangerous driving. Whalen, who was on a stolen Triumph Daytona 650cc, also admitted causing his victim severe injury. The pair drove at high speed through the centre of the city until they came to a pedestrian crossing on Ferry Road outside Drylaw Police Station. A police van was parked outside. Miller drove over the crossing at 40mph, followed by Whalen, doing an estimated 50mph. Whalen’s bike struck the ten-year-old on the crossing. After hitting him, Whalen ran off, jumped on the back of Miller’s bike and they fled.